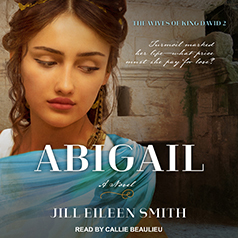 Jill Eileen Smith presents Book 2 in the Wives of King David series. What price must she pay for true love? Her days marked by turmoil and faded dreams, Abigail has resigned herself to a life with a man she does not love. But when circumstances offer her a second chance at happiness with the handsome David, she takes a leap of faith to join his wandering tribe. Still, her struggles are far from over. How can she share his love with the other women he insists on marrying? Abigail follows the bestselling Michal and continues Jill Eileen Smith's rich story of David's wives.